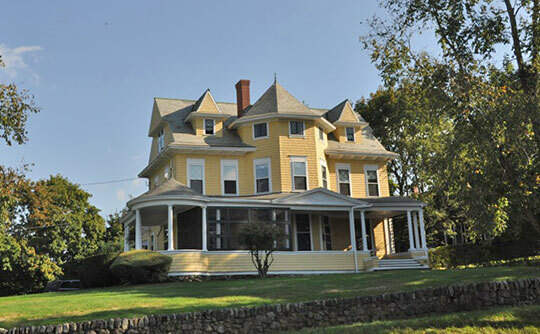 Ipswich Town Hall is located at 25 Green Street, Ipswich, MA 01938; phone: 978-356-6608. Photo: Bailey House, ca. 1893, 40 Market Street, Ipswich, MA. Listed on the National Register of Historic Places in 1980. Photographed by User:Magicpiano (own work), 2012, [cc-by-3.0 (creativecommons.org/licenses/by/3.0)], via Wikimedia Commons, accessed September, 2017. The Central Village, Ipswich, MA, Multiple Resource Area was listed on the National Register of Historic Places in 1980. Portions of the text below were adapted from a copy of the original nomination document. [†] Adaptation copyright © 2011, The Gombach Group. Ipswich is a pleasant, small town with a central village surrounded by salt marshes, fields, and forests, and bisected by a tidal river. The varied habitats of the area have supported human settlement for over 10,000 years, and attracted European colonists in the early 17th century. Throughout the town, valuable evidence of the many centuries of habitation remains below the ground. Within the central town area covered by this survey, a particularly rich reservoir of houses remain, defining the town's development over the past three and a half centuries. The pattern of 17th century development, and the town's growth and adaptation through the 18th and 19th centuries are reflected in an unparalleled concentration of 17th century houses, and a multitude of 18th and 19th century structures. The quantity of early dwellings in Ipswich determines the town's peculiar significance as a record of American architecture, settlement patterns, and town development from the 1630's to the present. It is considered to be of national significance for that reason. Agawam was the Indian name for this region when, in 1614, Captain John Smith reported, "this place might content a right curious judgment, but there are many sands at the entrance of the Harbour, and the worst is, it is imbayed top farre from the deepe sea." Boston itself was only three years old when the Governor and Council of the Massachusetts Bay Colony resolved to "hasten the planting of Agawam." John Winthrop, Jr., the Governor's brilliant, eldest son, led the expedition in March of 633. The first houses were "wigwams, huts, and hovels" built against the hillside near what is now the Town Wharf. By order of the General Court, dwellings had to be within one half mile of the Meeting House at Meeting House Green. Outlying lands were for tillage, pasture, and wood lots. The settlement prospered. On August 4, 1634, the Court of Assistants changed its name to "Ipswich" in acknowledgement, they said, "of the great honor and kindness done to our people who took shipping" in that ancient English port. To this outpost came the most extraordinary of pioneer groups. "The peopling of the towne is by men of good rank and quality, many of them having the revenue of large lands in England before they came to the wilderness." Winthrop was shortly joined by Thomas Dudley, Simon Bradstreet, Samuel Symonds and Richard Saltonstall — two governors, one deputy-governor, and one magistrate. With them came America's first poetess, Anne Bradstreet, and her sister Patience, wife of Daniel Dennison, who was to become commander-in-chief in King Philip's War. These luminaries' houses are gone, but homes of their contemporaries still stand along High and East St., and elsewhere in Ipswich. "Glorious," Cotton Mather wrote, "was the Church of Ipswich." First and most brilliant of its scholar-ministers was Nathaniel Ward, lawgiver, wit, preacher and poet, who drew up the Body of Liberties, our first code of fundamental laws. His meeting house has been replaced several times, but on its site stands the present modern First Church in Ipswich, at the head of Meeting House Green. The Green has always been the religious and residential center of town, and long the commercial hub as well. By 1646 the population is thought to have been close to 800 inhabitants—146 families. Twenty or more ships bearing immigrants were arriving each year along the shores of the Bay Colony and the pressure to find suitable places for settlement increased steadily. Ipswich expanded along High St., which also was a key route to the more northerly towns. The street became a commercial and residential axis of the town, and still retains houses, shops, and taverns dating from the mid-17th century to the present. The town prospered along with the colony. Wharves were built and warehouses; land was set aside for the fishing trade; flakes for the drying of fish, dwellings for fishermen, and an acre of land for cultivation by each boat's crew were provided. Many of these activities centered in Ipswich's "East End". The exportation of salt hay from Ipswich by barge was to continue for more than 250 years. Hunting and trapping diminished in importance; fishing and lumbering steadily increased, as did ship building. Staves, clapboards, masts and pre-cut timbers for houses were exported. This mercantile success of the colony, of which Ipswich was a part, became a source of concern back in England. Britain's determination to impose limiting regulations on commerce was ill-received in Ipswich. As early as 1687, the town had distinguished itself by public protest against taxation without representation Governor Andros, in response, imprisoned three town leaders in what became known as the Andros Rebellion. Commemorating this incident, the Town Seal of Ipswich bears the words "Birthplace of American Independence." Col. Appleton was a participant in that Rebellion, and his house stands at the foot of Meeting House Green. In 1766, the town representative in the colonial legislature was replaced because his votes did not strongly enough reflect the bitter feelings of town meetings; dissension grew as the decade passed. Ipswich minutemen were marching toward Lexington and Concord by late afternoon on April 19, 1775. Their training field was the South Green. One of the many colonial homes that flank the green is Col. Nathaniel Wade's, to whom Washington gave command of West Point when Benedict Arnold deserted. After the eight years of war, the plight of the old town was acute. So many men had been away that agriculture suffered; markets for fish were lost; shipping diminished to the vanishing point; the war debt of the town was enormous and greatly complicated by currency and monetary chaos; relief of the poor was a staggering problem. The southwest Hamlet Parish thought it could manage better apart from impoverished Ipswich and so withdrew to become the town of Hamilton in 1792; with it went the richest farms. When the southeastern Chebacco Parish withdrew in 1819 to become Essex, the shipbuilding revenues were for the most part lost to Ipswich. Population figures for Ipswich tell the story. In 1790 in the first federal census, Ipswich showed nearly 5,000; by 1820 the town registered 2,550. The sandbar at the mouth of the Ipswich River, observed by Captain John Smith long ago and marked today by the line of breakers about a half-mile off Crane Beach, may be considered the single most important reason for the survival of so many old houses in Ipswich. Most Ipswich families in the early 1800's had a seafaring member, but he shipped out of Boston, Salem, Beverly, or Newburyport—all blessed with deeper harbors. Prior to the building of the Newburyport Turnpike after 1803 (now Route 1), all overland communication between Boston and Newburyport, Portsmouth, and Portland was through Ipswich. The turnpike, although not in itself immediately successful, certainly helped to make Ipswich the quiet town it became. The new road bypassed Ipswich to the west, diverting the north-south traffic through neighboring Topsfield. Ipswich, but apparently this was a subsistence activity of an impoverished population, rather than a lucrative craft. With the nineteenth century development of lace machines, the market for Ipswich's handmade produce disappeared. The Industrial Revolution brought to Ipswich several small and fitfully prosperous textile mills, and with the incorporation of Ipswich Mills Co. in 1868, an extensive hosiery factory. To man this enterprise came new settlers from Nova Scotia and Quebec and, a generation later, from Greece and Poland. Today, though the hosiery mills have ceased operation, the town population has been increased by metropolitan commuters and numbers 12,000. It supports two local newspapers, nearly a dozen churches and a score of clubs and societies. In the 20th century as in the 17th, the citizens of Ipswich excel in many fields, and as before, they center their lives within the boundaries of river, sea and salt marsh. † Candace Jenkins, Edward Zimmer and Margaret Welden, Massachusetts Historical Commission, Central Village, Ipswich, MA, Multiple Resource Area, nomination document, 1980, National Park Service, National Register of Historic Places, Washington, D.C.